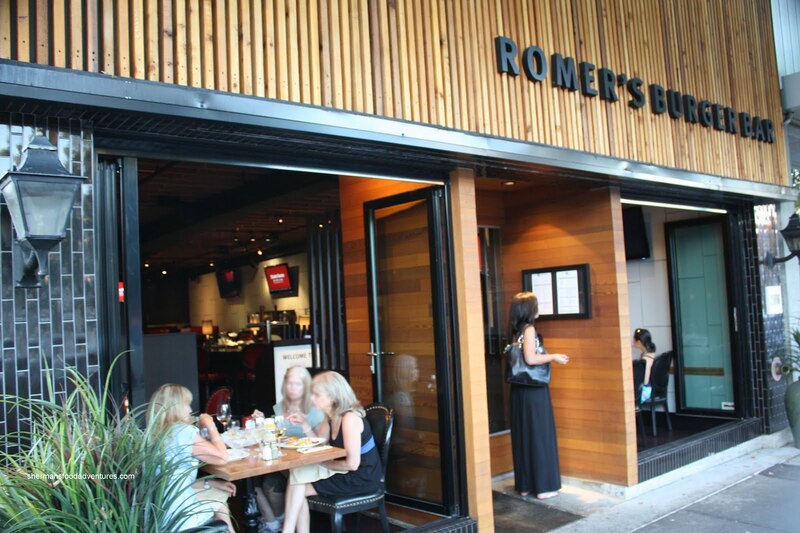 Boy, I haven't been back to Romer's since it opened in 2010. That was after our softball game where the whole team descended on the former location of Pinky's Steakhouse. With the remnants of past decor combined with the premise of gourmet burgers, we came away satisfied. That was quite the feat since we had 8 people with different tastes. Fast forward almost 2 years and I get an invite to sample one of their Brewmaster's Dinners. 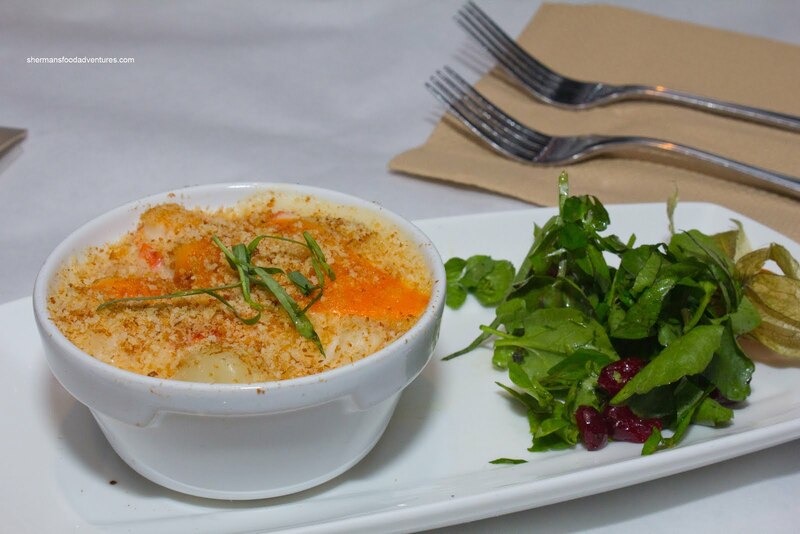 Think along the lines of the Long Table Series at the Irish Heather. 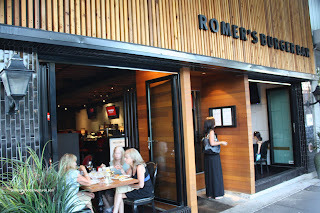 At Romer's, this meal is held in the "vault" downstairs, where there is communal seating at 2 long tables. The meal is a ticketed event that needs to be booked in advance. 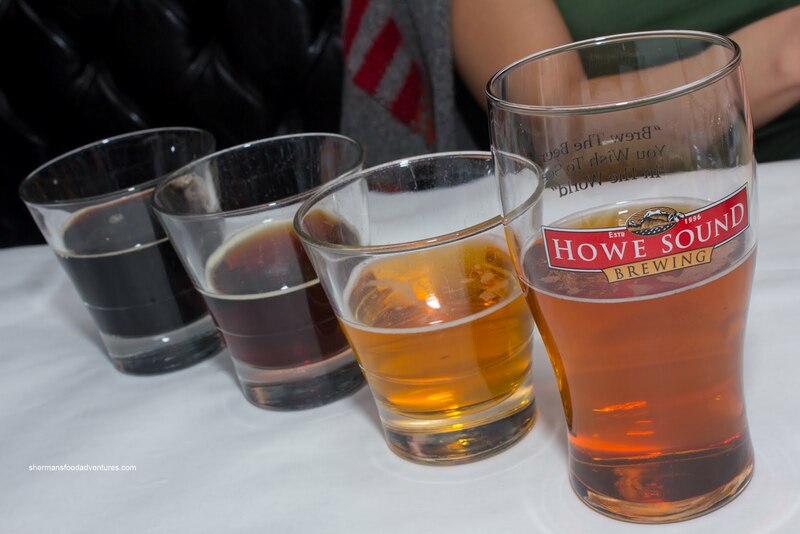 For tonight's dinner, Howe Sound Brewery was featured where every one of our 3 courses was paired with a specific beer. In addition, we were treated to a souvenir glass along with a can of Howe Sound Lager . Since Miss Y was with me the last time I was here, it was only natural she be my guest for the meal. We got to know our neighbours quite well since they were obviously enjoying their brew. In particular, Rosie and Bra-Lady. Yes, they wanted to be mentioned in the blog... LOL... As mentioned, we started off with the Lager and then progressed to the Garabaldi Honey Pale Ale, Nut Ale and lastly, the Diamondhead Oatmeal Stout. For Miss Y and I, the clear winner was the Honey Pale Ale since it was smooth and had a nice finish. Onto the food, we started with the Lobster Gnocchi & Cheese. Hidden beneath the crispy crumb coating and melted cheddar was a rich, creamy mixture of white cheddar, black truffle oil, honey pale ale and tarragon. The sauce definitely had a bite and was cheesy-smooth. I found the gnocchi to be on the denser side, yet I didn't mind it since I'm not a huge fan of mushy gnocchi. 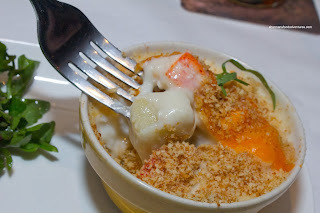 There was a good gnocchi-to -lobster ratio where the meat was perfectly cooked. It was accompanied by a watercress and dried cranberry salad with tarragon dressing. For our "burger", it was something out of left-field. Or should I say it was from a field? 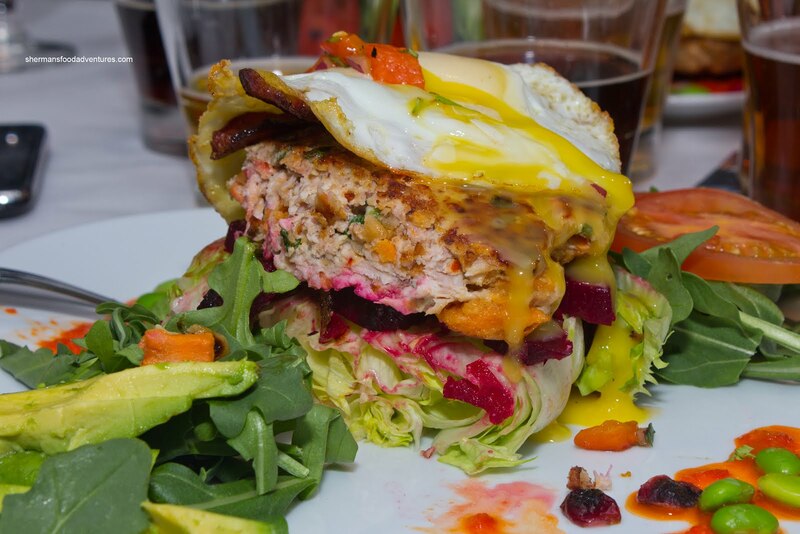 We were presented with the Kitsilano Paleo Special consisting of a lean turkey burger combined with cilantro, chili flakes, cumin, nuts, cranberries and yams. It rested on top of a lettuce tower, with roasted beets, topped with apple wood bacon, fried egg and roasted pepper salsa. Vine-ripened tomatoes and fresh sliced avocado was served on the side with a red pepper drizzle and edamame. When I first looked at it, I asked myself, "what's with all the vegetables? ", figuring that I would not be satisfied. How wrong I was. Sure, I dusted the whole thing off, but I was full. Apparently, they did not add any extra salt other than the pre-existing sodium in the bacon. As skeptical as I was, I enjoyed the burger. Now, I still would've preferred a beef burger with the works, yet this was more than acceptable. The patty was moist and somewhat spicy which was balanced by the sweet cranberries. 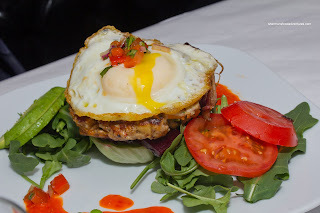 With crispy bacon and a runny egg yolk, there was body to the burger. With all the greens on the plate, I actually didn't feel any guilt. Well, there was guilt with the gnocchi and then finally a bit more guilt in the dessert. 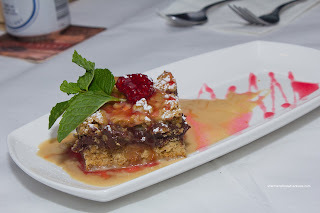 We were presented with the Oatmeal Fudge Bar with a stout creme anglaise and raspberry coulis. Although I found the bar itself to be a touch dense, the mild sweetness won me over. I personally hate desserts that rely too much on sugar. This one, I could taste the chocolate and the subtle hit of booze was a surprisingly flavour addition. This was a pleasant end to an unexpected 3-course meal at Romer's. For $28.00, considering the amount of beer included (of course the beer company is promoting their stuff), the meal is well-priced. Definitely a unique experience for those who want something a bit different.